10"Dia. x 4"T; holds 2.5 quarts. Inspired by Burano, the island off the coast of Venice famed for its handmade embroidered lace. 12"Dia. x 3"T. Hand-painted ceramic with unique uneven edges, making each piece one of a kind. Dishwasher safe on low-heat setting. Made in Italy. Three petite serving bowls on connected base. Brass-plated stainless steel. Base, 18"W x 6"D x 3"T. Each bowl, 5" Dia. Three petite serving bowls on connected base. Brass-plated stainless steel. Base, 18"W x 6"D x 3"T. Each bowl, 5" Dia. x 3"T. Hand wash. Imported. 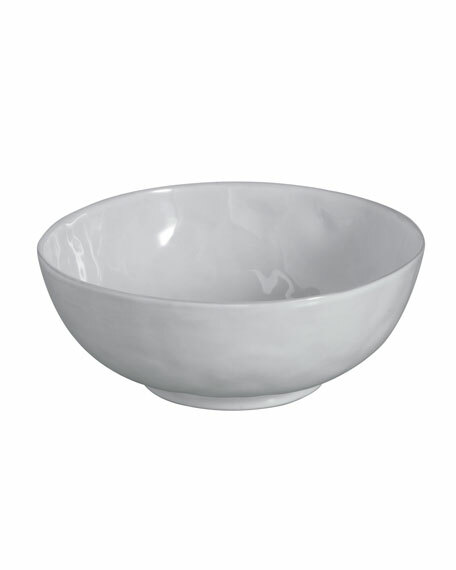 Serving bowl made of heavy-gauge, hand-glazed steel. Hand-painted Courtly Check® decoration. Rolled edge. Hand wash. 11.5"Dia. x 3.75"T; holds five cups. Imported. Handmade, hand-glazed terra cotta serving bowl. 12"Dia. x 2.75"T. Holds 6 cups. Made in the USA of imported materials.